Dimensions 0 by 5 by 7.50 in. International trade deals have become vastly complex documents, seeking to govern everything from labor rights to environmental protections. This evolution has drawn alarm from American voters, but their suspicions are often vague. In this book, investigative journalist Haley Sweetland Edwards offers a detailed look at one little-known but powerful provision in most modern trade agreements that is designed to protect the financial interests of global corporations against the governments of sovereign states. She makes a devastating case that Investor-State Dispute Settlement -- a "shadow court" that allows corporations to sue a nation outside its own court system -- has tilted the balance of power on the global stage. A corporation can use ISDS to challenge a nation's policies and regulations, if it believes those laws are unfair or diminish its future profits. From the 1960s to 2000, corporations brought fewer than 40 disputes, but in the last fifteen years, they have brought nearly 650 -- 54 against Argentina alone. Edwards conducted extensive research and interviewed dozens of policymakers, activists, and government officials in Argentina, Canada, Bolivia, Ecuador, the European Union, and in the Obama administration. The result is a major story about a significant shift in the global balance of power. 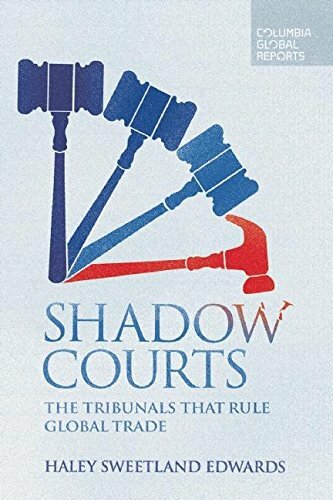 About: "Haley Sweetland Edwards explains the history of global shadow courts and how these courts have spun out of control, threatening the interests of citizens everywhere including the United States.